Why the Philippines and Why Now? 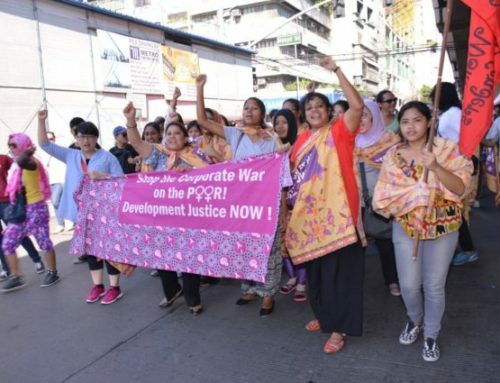 In the past two years the situation of human rights and democracy in the Philippines in general and women human rights defenders in particular have gone from bad to worse under the Duterte Administration. 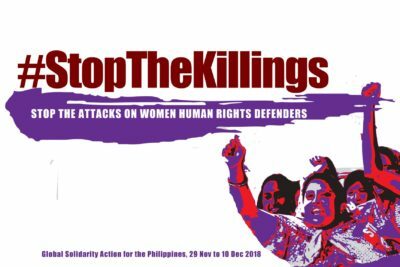 The alarming statistics are rising with 196 Extrajudicial Killings, 415 cases of political detention under trumped-up charges, and over 70,000 cases of harassment, threats and intimidation against W/HRDs. Almost every possible regional and international human rights venues have been exhausted but the government has decided only to either ignore recommendations from those processes oreven harshly suppresses dissenting voices and peoples’ resistance calling for human rights, justice and accountability. Now it is more than ever clear that changes can happen only through peoples’ organising, mobilising and solidarity support. 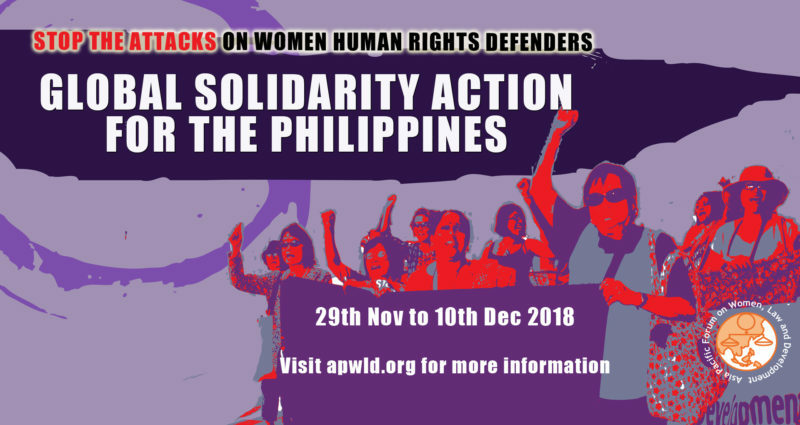 In light of this, the Asia Pacific Forum on Women, Law and Development (APWLD) enjoins members and allies in the Philippines, the region and the international human rights community for a series of Global Solidarity Actions for the Philippines. 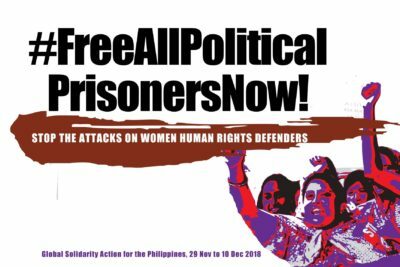 This campaign will be held from 29th November 2018 to 10th December 2018, highlighting 29 November 2018 (International Women Human Rights Defenders Day), 3 December 2018, (International Day in support for the Release of Political Prisoners), 10 December 2018 (International Human Rights Day). We need your solidarity and actions so that people in the Philippines continue to resist with hope, and for the Duterte Administration to feel even more threatened by the international community’s solidarity outcry and surrender its power back to people’s sovereignty. 1. 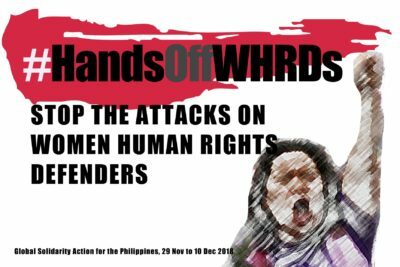 Sign on to the letter to President Rodrigo Roa Duterte to cease attacks on women / human rights defenders in the Philippines. 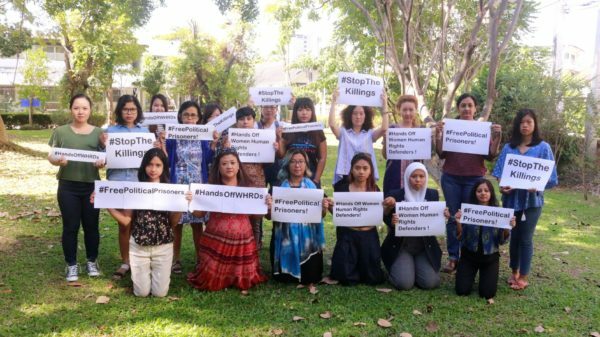 You can also share a solidarity video or photo messages to WHRDs in the Philippines. Sample photo of solidarity action for the Philippines. 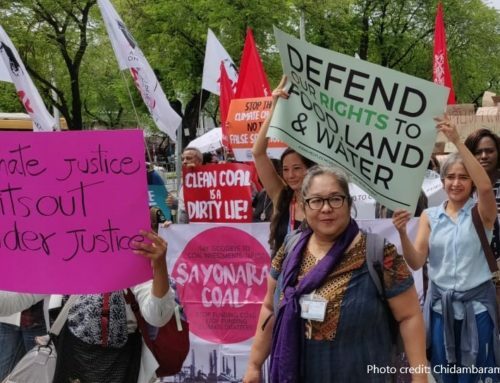 The Philippines Government needs to be held accountable for the killings, attacks, judicial harassment and criminalisation of the work of human rights defenders, and political dissenters. 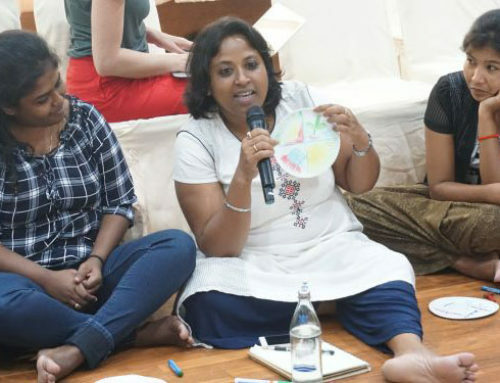 WHRDs who work, consistently and tirelessly in upholding the rights of women continue to be subjected to threats and intimidation, vilification and surveillance by state security forces and their cohorts. 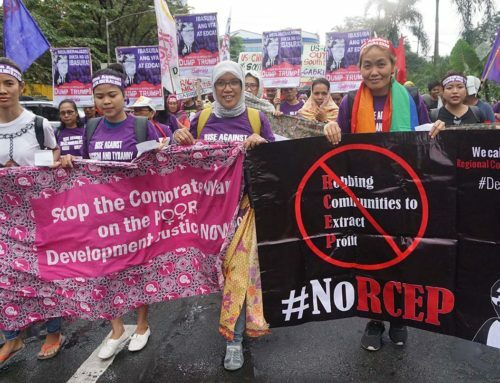 Human Rights Defenders are not criminals or terrorists and speaking up against the president and calling attention to gross human rights violations in the country and elsewhere are not acts of terrorism to be punished. 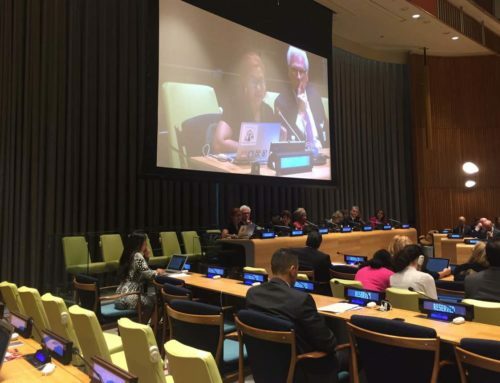 The Philippines Government should provide access to justice to victims and survivors of human rights violations conducted by state and non-state actors in the context of ‘drug war’, counterinsurgency programme and attacks against political dissenters or human right defenders. It’s time to certify the urgent enactment of House Bills 1617 and 8128, two important pieces of legislation that will recognise and protect human rights defenders in the Philippines. The current administration’s counterinsurgency program dubbed Oplan Kapayapaan is essentially an internal security plan meant to target government opposition , political dissenters, any and all groups that oppose the government. It is the blueprint that guides the operations of the military and the police legitimising extrajudicial killings, arbitrary arrests, judicial harassment, vilification, intimidation and surveillance of political opposition and human rights defenders.